This was a good vacation read. I sat on a tropical beach looking out upon an empty ocean and could imagine Lo on the cruise ship Aurora as it travelled to the North Sea. She was there to write a travel piece on the newly launched ship, but events happened that kept her mind off the job. 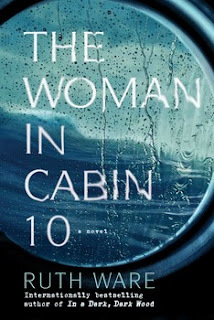 After reporting the disappearance of the unknown woman in cabin 10, she found herself more alienated by the staff and crew and totally isolated from the outer world. She might as well have been adrift on the ocean I was gazing out at. I enjoyed the set up for the mystery with the introduction of the guests and staff followed by the tour through the ship. I could easily imagine the crowding in the staff quarters and the claustrophobia that Lo felt. The plot was well constructed and kept me guessing. I didn't feel an affection for any of the characters but I did want Lo to get a grip and start being a better journalist. She missed too many opportunities to do her job well. She should have been much better as socializing and asking leading questions. Overall, a good, easy to read story. I had seen this around but never got around to even reading a review. Thanks.